Considering their prices, a DC Direct figure winning this award seems pretty unlikely, but Blue Beetle give you your money's worth. He has a great design that's been captured perfectly for this figure, and he has more articulation than any DCD figure before him - even though he doesn't have a waist. His accessories add a lot of playability, and he even has a variant that comes straight from the comics. But ultimately, what finally put him above a field of tough competitors was availability: you really had to scour the shelves to find most of the others, but BB was simple to find both in comicshops and, later, in "market six" locations. If you don't already have Blue Beetle, go find him; he's worth it. Other nominees included DCSH Clayface • McQuarrie Concept Boba Fett, a mixture of a cool design and a well-made figure • Judge Death is an excellent all-around figure with a plentiful variant • the Music Label Soundwave for delivering on a 20-year-old promise • Yellowjacket for the completely inappropriate sculpt of his hands • 2008 Concept Bumblebee because it reimagines a classic character, and does it well • TFAC Snake-Eyes for being a great update with an awesome sculpt and awesome accessories • TFAC Firefly, for the same reasons • Savage Dragon is a fairly comic-accurate figure with tons of articulation and a nice variant • VTAC IG-88, because it's probably the best representation of the character since the original prop • Masterpiece Starscream had just enough changes from his Japanese counterpart to get a nod • Hellboy Graveyard Skeleton, which is anatomically incorrect but still incredible work • Player Select Kratos, a huge leap forward for a company known for its lack of articulation • Unleashed 360 Sandman, for displaying the level of quality and fun accessories that the Spider-Man 3 figures should have had since the beginning • Jetfire, for giving us an update of a figure we never thought we'd get, and doing a lot to honor the character's roots along the way. The reason that the GI Joe TFAC line (as it's known to fans) won this category was that it was such a strong competitor in every other category. Honestly, every facet of this line is great: the sculpts, paint and articulation are all superb, especially on a 4" figure; the packaging design for both the individual figures and the five-packs is excellent; the character selection is wonderful; the accessories are wicked; and best of all, the figures retail for about $5 each, giving you a huge value for your money. GI Joe TFAC wins Best Line, if only so it doesn't sweep every other category. Released at the end of the Sigma 6 line, "Crime Boss" Destro is still proving kind of hard to find in some places, but he's definitely worth the hunt, considering the accessories he comes with. Sure, the guns are nice and whatnot, but the star of the show is the safe deposit box he's seemingly stolen from some bank, and the cash that fits inside it. With four gold bars and several stacks of bills, this is enough loot to finance illegal activites for some time to come. Other nominees included Gung Ho's grenade launcher, which not only opens, but features a moveable range finder • "Chosen" Willow's laptop computer, for highly accurate detail both inside and out • Mephisto's throne, for being as much a reason for a purchase as the figure itself • Alucard's vial of Holy Water • Domino's pistols for a simple, realistic design • Ed's Playstation controller, for duplicating real-world details on a much smaller scale. • Mr. Mind, the original conquerer worm • Mrs. Claus' North Pole base, because it almost looks innocent once you remove her from it • Scarecrow's noose, for working as a necktie and an accessory • Zombie Wasp's head • the Riddle family grave, for being an articulated accessory with an accessory of its own • Hagrid's lantern • Minimate Skeets • Serpentor's helmet under glass • the magnetic Akamaru that sits on Kiba's head. The packaging is big and colorful, and can be easily opened by slitting the tape on the back. The card can be slid out of the bubble, the figure can be removed, and if you ever feel like re-sealing your pal in his plastic prison, all you've got to do is pop him in and slide the card back. Plus, its design can be easily adapted for multi-packs. Other nominees were Spider-Man Origins for its unusual, clever design • Star Wars 30th Anniversary Collection, because those angular, black and white cards really stand out on the shelves • GI Joe 25th Anniversary Collection, both boxes and cards • the Real Gear Robots' rounded blisters • Hasbro Legends, for ditching the stupid clamshells • Stan Lee's box, which tells a little story when you open it • Manbat, for the combo of the shipping crate and the "bat" box inside. It doesn't matter how good a toy is if no one can find it, and this year seemed particularly bad about that. DC Superheroes suffered from huge delays and the same terrible casepacks we blasted Mattel for three years ago, leaving a lot of fans missing a lot of popular characters; Transformers toys sold out and were understocked for months after the movie opened, and again right before Christmas - a huge failure for any toyline; GI Joe TFAC restocks failed to keep up with sales, and most stores reassigned the shelf space; Hasbro Legends would show up in limited areas, then disappear for months before fans could find them - and forget trying to find the FF or Spidey Legends series; Star Wars shipped multiple waves at once, shortpacked the most popular figures and left rehashed figures pegwarming. 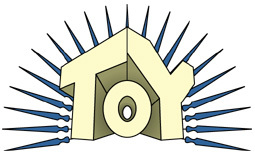 In all, 2007 was a year in which toy fans everywhere were faced mainly by empty pegs and a lot of frustration. Other nominees included Emma Frost, for being so goddamned ugly and reinforcing everyone's worst fears about Hasbro • "X3" Jean Grey, for the terribly off-model facial sculpt • Spider-Man and Fantastic Four movie figures, for reverting to the unpopular 5" scale and pegwarming like they'd been nailed down • Mattel, for their mishandling of the DCSH line (three Superman series in a row, each with multiple Superman variations and shortpacks of everyone else) • Mattel, for still not putting any girls in the Avatar line • Titanium Soundwave, being an unholy mess of a figure that any fan should be embarrassed to own • the useless swords that came with Noob Saibot • the FANtastic Exclsuive delays - way to go, China. Now that you know what's won this year, you can head on over to see our past winners. The Class of 2007 has joined some illustrious ranks, and they're all archived here.